Historians and philosophers will debate the rights and wrongs of the Royal Air Force’s bombing strategy – this is the bar to the proper remembrance of the courageous young men who ‘did the dirty work’ or took the fight to an evil regime and prepared the way for the invasion of occupied Europe. There should be little debate by historians – the RAF bombed German cities – fact. And philosophers such as Professor A C Grayling are anti-war anyhow – evidenced by his examination of WW2 bombing ‘Among the Dead Cities’ where he carefully sets out the pros and cons and ignores the arguments in coming to his conclusion. The ‘Establishment’ is afraid of the idea that non-combatants in a country committed to total war were killed by ‘our’ bombing. It is a fact of the Second World War. Hitler’s regime deserved it for what they were prepared to do and were doing. What could or should have been done instead is irrelevant. The cousin Jims, the Norman Lyfords, Frank Laws, the Val Richters, Roy Fennells, Johnny Daniel, Bill Allan, Charles Cushing and all the ‘unknown’ and forgotten airmen deserve our recognition that they were prepared to give up their own normal, everyday lives and fight against an evil regime. 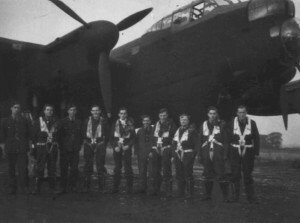 And, just as brave men from 617 Squadron lost their lives attacking the Ruhr Dams, brave lads serving in ‘main force’ squadrons lost theirs just the same – their missions, flown whenever deemed possible with the aim being to weaken the enemy until ground forces could practicably finish the job. It is not enough for me that Jim Ives is commemorated on the Runnymede Memorial, or that Davey Johnson’s remains are in the Berlin 1939-1945 War Cemetery or that Alan Jones has a headstone in Hanover War Cemetery. They deserve that we know who they were, what they did, and what they gave up. The trials and tribulations of being a member of a split crew and of crew-mates being killed flying as spares helps us to understand the added stresses and burdens young men of nineteen, of twenty-one or so had to deal with – over and above the fear of their own death. F/Sgt Val Richter’s pride must have taken a bruising having been posted back to a Conversion Unit just a few days after reaching an operational squadron, and what of his confidence and self esteem (or is that just a 21st century phenomenon)? Just as Jimmie Ives’s new crew at 100 Squadron must have regarded him with suspicion, Val Richter’s, newly picked up from 1662CU surely must have wondered about their new pilot. F/Sgt Richter soon came to operations with a posting to 103 Squadron a matter of days after leaving RAF Kelstern. His was one of thirteen crews from RAF Elsham Wolds cancelled for the Berlin operation of 23rd/24th November. 103 Squadron’s ORB described its performance on this night (possibly somewhat harshly) as ‘a most unfortunate effort, as thirteen aircraft failed to take off and five returned early. The take-off was on the long runway which was cross-wind, and as the wind was approaching gale-force, many swung off the runway and had to have a further try, or were scrubbed.’ Take-off was considered by many aircrew to be the most harrowing part of an operation – just try to imagine the tension at having ‘to have a further try’ in gale force cross-winds fully bombed and fuelled-up! F/Sgt Law ‘abandoned his mission because of a sick navigator, position 5300N 0540E’. W/O M J Graham’s was another of the crews to be scrubbed. ‘The heavy flak was very intense in barrage form and a great deal of light flak was bursting at about 15,000ft. Searchlights in cones were very numerous. Theo Boiten cites two ME110s being shot down that night – one in the Giebelstadt area (South of Wurtzberg – the route for the Stuttgart contingent of the bomber force) and the other near Bad Orb, the latter having received enemy fire (feindbeschuss) which may have been Sgt Jacobs’ claim. (Bad Orb – to the NE of Frankfurt was just beyond the turning point for the Berlin raiders that night). The squadron record book further noted that on return F/O Brevitt and all his crew were killed, with the exception of mid-upper gunner Sgt Bowyer, who was seriously injured, when their aircraft collided with a Halifax while approaching to land. ‘This was shockingly bad luck as they had obviously done the distance and were back with the main stream. F/O Pugh, F/O Sumner and Sgt Siddall and their crews failed to return. F/Sgt Richter was one of the pilots to put down at Middleton St George. Val Richter’s crew were not available for the following Thursday evening when the next Berlin raid was called (2nd/3rd December), nor were Frank Law’s crew offered for this op, but his f/e Sgt Robert Stocks filled a temporary vacancy in F/O Churchill’s aircraft and Sgt Johnny Daniel was flying as mid-upper gunner in F/Lt Francis Hopps’ Lancaster. Hopps’ aircraft was one of three posted ‘missing’ from 103 Squadron that night, all were lost in the vicinity of ‘the Big City’ with no survivors. The next evening Leipzig was the target city – Sgt R B Stocks again flew as a spare bod with F/O Churchill and Law’s other a/g Sgt Cyril Plampton flew with P/O Floyd. Thursday 16th December 1943 was to be a significant date for many in RAF Bomber Command – ‘Black Thursday’. Jimmie Ives was kicking his heels at RAF Wickenby – a pilot without a crew. Losses incurred by 100 Squadron on ‘Black Thursday’ would bring about his posting to RAF Waltham. 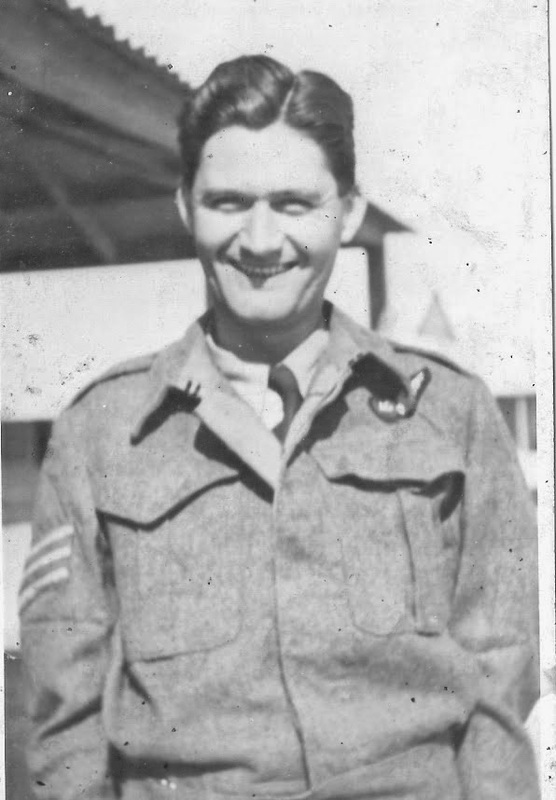 Jim’s former f/eng Sgt Don Bell flew with P/O Len Young that evening – their sortie was cut short due to engine trouble, they bombed the island of Texel having made only 15,000ft. The evening started tragically for 103 and its sister squadron 576. Despite not appearing on the battle order for that night’s operation F/Sgt Frank Law suffered the loss of two more of his crew-mates in the mid-air collision just after take-off between Lancasters JB670 and JB746. It seems that F/Sgt Val Richter was following correct procedure having taken off at 16.37hrs – Lancaster JB670 was climbing away into low cloud when it collided, apparently head-on, with JB746 of 576 Squadron, inexplicably flying a reciprocal course having lifted off a minute ahead of Richter. Both aircraft, laden with 1,850 gallons of fuel and 4¾ tons of high explosive and mixed incendiaries, exploded and were completely destroyed. Frank Law had now lost three from his crew – Australian b/a Les Kay and a/gs Jack Daniel and Cyril Plampton. Sgt Robert Stocks, flying that night with F/Sgt McMahon, returned to fight another day. Richter’s ‘scratch’ crew was actually made up of half of his, two members of Law’s crew and a/g Sgt Furrie, apparently flying his first op. Sgt Francis Furrie, 24 years old, was the son of Michael and Ellen Furrie of Whifflet Street, Coatbridge, a coal mining, iron making town on the eastern edge of Glasgow. Navigator Charles Jaques was a thirty year old married man with an infant daughter, wireless op Peter Coopman, 21, had been married for only three months. Sgt Frederick Copping was a single man, just turned twenty-one, from Walthamstow. 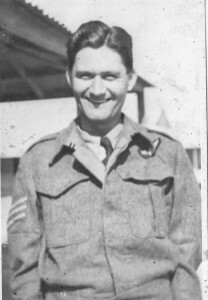 Valentine Richter himself was one of five siblings – the only lad amongst four sisters, one of whom – Rosalie – emigrated to Canada in the mid 1950s. The others Marguerite, Joyce and Betty married – Messrs McGowen, Vodden and Chapman respectively. If any of Val Richter’s nephews or nieces can tell me more about their uncle I would be very grateful if they would please contact me. On the following Monday evening, 20th December, Sgt Stocks again joined F/O Churchill’s crew for the operation against Frankfurt and chalked up another completed sortie. Berlin bound 103 Squadron Lancaster JB730 took off 45 minutes after midnight on 24th December with W/O Michael McMahon RAAF at the controls, beside him Bert Stocks, flight engineer. ‘The aircraft left this base at the appointed time and since then nothing has been heard of aircraft or crew’. At around 03.00 local time a four-engine British aircraft approached the village of Obersain (about 19 miles north-east of Koblenz) from a southerly direction. The aircraft was on fire and crashed about 600m north of the village, exploding on impact with the ground. The remains of the seven crewmen were buried in a communal grave near a wood some 50m north of the crash site. The burial plot was enclosed by a fence and marked with a plaque bearing the inscription ‘hier ruhen 7 Englishe Fleiger Gefellen Am 24.12.43 R I P.’ . 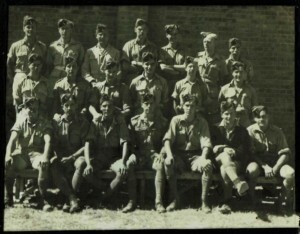 The crew was subsequently identified only by the village Mayor’s recollection of the name ‘Thompson’ from a dog-tag – all the crews’ effects had been removed to Luftwaffe Command at Wiesbaden. A claim for a Lancaster ‘Abschűsse’ by Lt Erich Jung of 6/NJG2 in the vicinity of Ober-Sayn at 02.30hrs is suggested by Dr Theo Boiten to have been JB730. David Mackay (who had possibly already been posted away, not to fly again), Ron Johnstone and Frank Law had lost four friends…. Johnny Daniel, Dave Mackay, Frank Law, Ron Johnstone, Cyril Plampton, Bert Stocks, Les Kay. And the remainder of Val Richter’s crew – b/a Cecil Baldwin, f/e Albert Daines and a/g Sgt Jacobs were also in a state of limbo, without a pilot, navigator, flight engineer or wireless op. These remnants would subsequently combine to fly as the latest incarnation of pilot Frank Law’s crew plus flight engineer Don Bell and navigator Ken Flowers, until this crew too met its destiny. The lucky ones survived the war, the others did not, as their fate caught up with them. 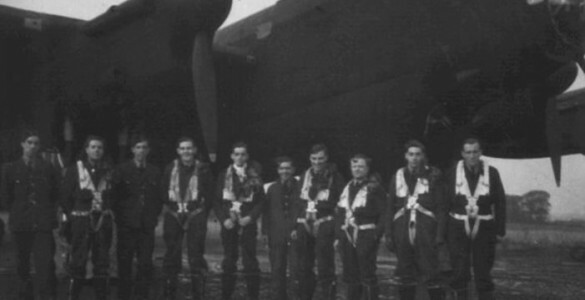 They each deserve to be recognised as a courageous young man of Bomber Command. As we now know Frank Law is remembered by Mick as the ‘Count of Elsham Wolds’ and by Don Bell’s family as ‘the bravest man we never knew’. Better to remember F/Sgt Val Richter as a six foot two inch pilot graduate of the ‘Arnold Scheme’ class 42B, who’s crew managed to account for a ME110 night-fighter (probably) on their only completed sortie, than solely as a name on a memorial to two crews killed in a mid-air collision. Keep an eye out for more about these fellows, coming soon.